The history of Koroni begins from the 4th about FrCh c. Then of course was where today Petalidi and first name, according to Pausanias, was Aipia. The current name comes either from the first settler of the Epimilidi, who came from Koroneia Boeotia, either in the tradition of some copper ‘rook’ (crow-currency), found in the foundations of the wall of the citadel. Today Koroni is built on the site of Ancient Assini in the 5th or 6th century BC and refers to Justinianic ‘Hierocles’ named as Koronia. South of the ancient city on the beach have been uncovered the few remains of the Sanctuary of Apollo, while another deity worshiped in ancient times the area was Athena. The great period of prosperity and reputation of the state begins in the years the Franks occupied the Peloponnese. The two-storey houses with balconies and ornate facades, talking about nobility, but also to the edge of the state in past seasons. 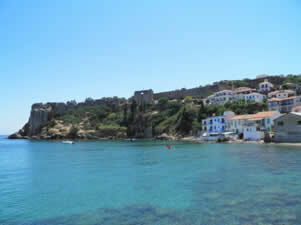 Koroni with Methoni are two states that have experienced great prosperity from the 13th to the 17thcentury and have been the key ports for trade to and from the East, the “eyes of Venice” in the southeastern Mediterranean. The geographical position always estimated for transit trade. 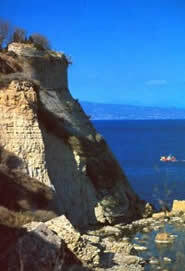 The imposing figure of the peninsula with the large amount and wide area offered for fortification and provided security, more than other coastal Messinian fortified cities. 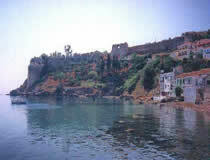 The castle was built by the Venetians in the late 13th century on the spot where once stood a Byzantine fortress. The yard extends over 400 acres and occupies almost the entire Cape Akritas. The main features are perisothei and testify to its imposing size and excellent architectural design. Over the ancient Acropolis, where the fortress was built, there were ruins of temple of Apollo.In its place has been built, Byzantine church of Hagia Sophia. If you find yourself even on site are small little columns of the base of an ancient temple to remind its presence. Thus, it is also through space and time one shrine to another each basis for the next religion. On the south side there are steep cliffs, ending at a beach. Nearby is the site of the Holocaust of the revolution, the “Resalto” (Italian word for assault, assault). The north, which is the main entrance of the castle leads to the houses of the settlement extending up the west side. The main entrance is on the north side and includes a large square building. Just above it there was room for the guard of the gate. In the construction of the wall, they used well-made stones and ancient building materials, now easily seen in the large tower and the wall next to the monastery of St. John the Baptist. In its heyday the castle was portico with pilasters either side and on top, a relief depicting the Lion of St. Mark. Today, much of this has been destroyed because of human intervention and weather. As soon as the visitor passes the gate towards the nunnery, see at the left side the church of “Agia Sofia”. This temple was initially small. Later a street apartment was added. This resulted to the outside of the church being and look bilateral with the original square domed section and the later “splint”. Inside the stunning architecture is presented that makes it one of the more special. The monastery of Prodromos is located to the west of Agia Sophia. Is female and is part of the old calendar. It consists of a low enclosure where many prominent shrines. The most famous cave is the “school” which in which one can navigate only with the permission and presence of the abbess. The area has the presence catacomb except that suggestibility is particularly conspicuous. Its characteristic is that the icons are arranged in rocks. Originally built by the Venetians and was dedicated to St. Rock (St Rok), for the redemption of the state of plague that had decimated the population. The Panagia Eleistria is the Muse of Koroni. All inhabitants of the honor and wealth of believers come to the temple to embrace its image. In rocky place where the picture was found, discovered and two, that the crucified and Evangelist Luke, causing awe and thrill to residents.